Originally published in SCU Today March 29, 2011. About a dozen Santa Clara University archaeology and anthropology students and faculty are getting an opportunity that comes rarely, if ever, to scholars of ancient life. 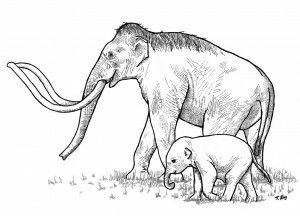 They are part of a team that is painstakingly digging up the remains of two Columbian Mammoths, creatures that lumbered the earth more than 9,000 years ago and have been entombed in clay mud in Castroville, Calif., apparently for centuries. For the past month, SCU’s students have joined faculty and students from Foothill College and San Jose State at the site, spending every minute of their spare time on the project. The students have not only been digging for bones, but they also built an irrigation system during the torrential rain storms last week so the site wouldn’t flood. 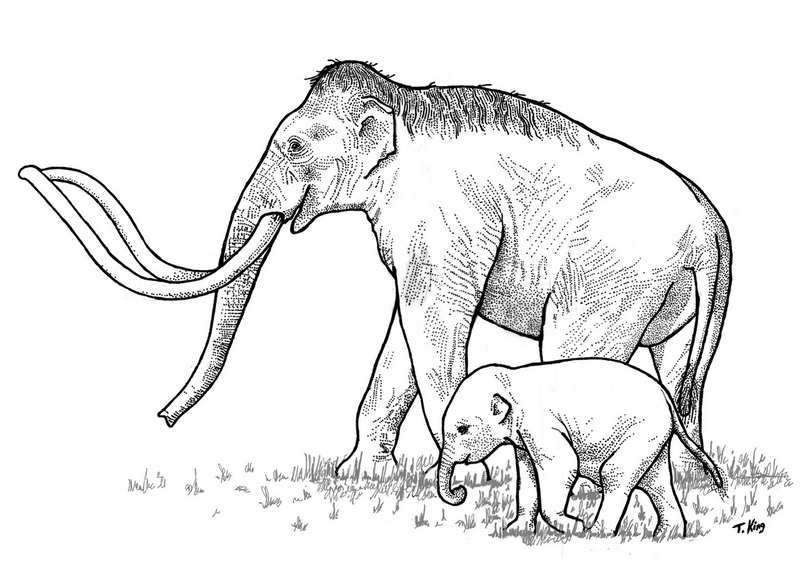 The one adult and one infant Columbian Mammoth resemble modern-day elephants with bigger bodies, more hair and fancier tusks. Fully grown males were 14 feet tall and weighed up to 10 metric tons. These new specimens were found on farmland in Castroville, a city about 60 miles south of Santa Clara in Monterey County, Calif., known for its artichoke crops. The farmer who owns the land in Castroville first found the bones in December while leveling his property with heavy equipment, exposing a tusk and molar. The farmer contacted Mark Hylkema, the Santa Cruz District archaeologist with California State Parks and the project director. Hylkema has since gathered a team including project coordinator Timothy King, an archaeologist and anthropologist at Santa Clara University, and site director Daniel Cearley, an anthropologist at Foothill College. The find is the first of its kind in Monterey County, though not in California. Others have been found in San Jose (2005) and Fremont (1960’s) and –significantly — in dated archaeological sites on the Santa Barbara Channel Islands, dating to circa 11,000 years ago. The team has uncovered about 10 percent of the skeletal remains, which are heavily fragmented and will need conservation and restoration. Archaeologists have also found hair, which may allow scientists to extract DNA. If successful, this will be the first published recovery of DNA from Columbian Mammoths, and it will also help experts learn the how they’re related to Wooly Mammoths and modern elephants. Larger than the better-known Wooly Mammoth, the Columbian Mammoth was likely a grazer and limited “browser,” eating grasses and sometimes low foliage. The Columbian Mammoth differs from the Wooly Mammoth in location, size, skull shape, teeth shape, and tusk shape – with Columbian Mammoth tusks spiraling inward, the Wooly Mammoth curling upward. Columbian Mammoths lack the large “knob” at the top of the head found on the Wooly Mammoth. The Columbian Mammoth likely lacked the full wooly “undercoat” of the Wooly Mammoth, but did have a long stringy “outer coat” similar to the Wooly Mammoth. Due to security and preservation concerns, visitors will not be allowed on the excavation site and its exact location is not being revealed. Watch a slide show of the excavation. Watch interviews with Dr. King and his students. Watch an exclusive news story from NBC Bay Area.